Michael Lim has every reason to be happy as he wishes people Happy Chinese New Year. 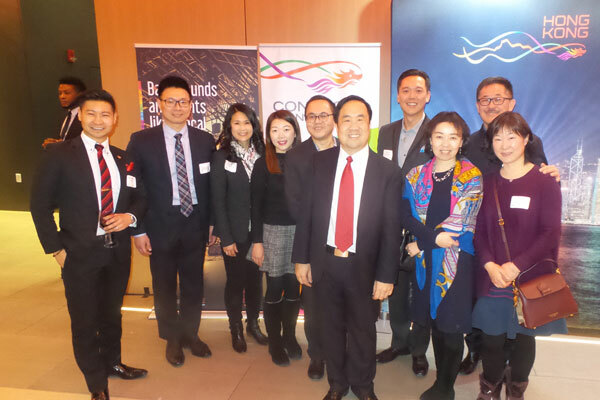 Lim, who oversees the Hong Kong Tourism Board’s Canadian office, promotes a destination that saw over 65 million visitors in 2018, among them 377,992 Canadians, a 2.1% increase from 2017. Lim said Hong Kong’s tourism attributes include its great outdoors, adding nature enthusiasts will be “amazed” by its natural attractions, with one site featuring volcanic columns formed over 140 million years ago. Lim added his destination has over 14,000 places where tourists can eat and which range from street food to Michelin-rated restaurants. He also praised Hong Kong’s “fantastic festivals” and told the gathering that March has been declared Hong Kong Arts Month. A Wine and Dine celebration and dragon boat competitions are other upcoming 2019 festivities. Hong Kong is slated to gain more than 20 more hotels this year in a part of the world that sees ongoing development. The Hong Kong Tourism Board is working with Taiwanese authorities to accommodate those eager to see two or more destinations on the same trip. Lim reported that over 90% of Hong Kong tourists visit at least one other destination on their vacation, with Thailand and Vietnam being among countries frequently combined with Hong Kong for a broader Asian holiday. Tourism authorities note that Hong Kong offers easy access to other parts of Asia, with Hong Kong-based Cathay Pacific and numerous other airlines having Asian networks that link Hong Kong with other countries in the region. As well, high-speed rail service can deliver people from Hong Kong to elsewhere in China. Pictured are Mark Hashimoto, Air Canada; William Wang, Cindy Lam, and Kristen Tse, Cathay Pacific; Harold Ho, Royal Scenic; Lim; Alan Law, GLP Worldwide; Wenting Yang, director, China National Tourist Office, Toronto; Patrick Tsung, GLP Worldwide; and Barbara Huang, China National Tourist Office.